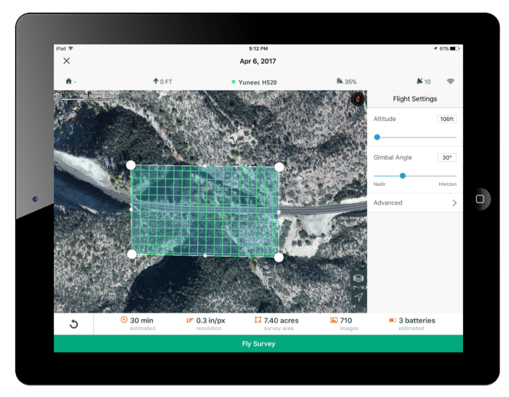 3DR, makers of Site Scan, has partnered with Esri to develop Site Scan Esri Edition, a custom version of its iOS app for drone flight planning and data capture that works seamlessly with Esri’s ArcGIS Online and Drone2Map for ArcGIS. The Site Scan Esri Edition app will complement Esri’s Drone2Map for ArcGIS software by providing full drone project mission planning and a simple workflow for transferring drone captured data into the Esri ArcGIS ecosystem. Users will be able to connect to ArcGIS Online with an Esri sign-in. The app will allow users to directly use Esri data layers from ArcGIS Online — including custom data layers from the user’s FedRAMP authorized ArcGIS Online organization account — as base and reference data for their drone flight planning mission. Esri customers can use any drone currently supported by Site Scan, including a variety of DJI drones. Site Scan also supports a custom version of the new Yuneec H520 commercial drone by 3D, which is based on the Dronecode PX4 software and designed to be an open and secure drone option for use on U.S. government projects. Site Scan Esri Edition app will be available on the Esri Marketplace in late September for free to ArcGIS customers.